Uniread aims at improving your reading speed by using a Spritz-like technique for fast reading. The application uses Node.js, runs on the command line, and it currently supports the EPUB and PDF ebook file types. According to Spritzinc, when you read "the eye seeks a certain point within the word, which we call the optimal recognition point, or ORP. After your eyes find the ORP, your brain starts to process the meaning of the word that you're viewing". They continue to mention that "when reading, only around 20% of your time is spent processing content. The remaining 80% is spent physically moving your eyes from word to word and scanning for the next ORP". Now back to Uniread. The command line tool has a limited set of features for now, as it's considered pre-alpha software, but it already supports displaying EPUB chapters, and can be controlled using the keyboard. 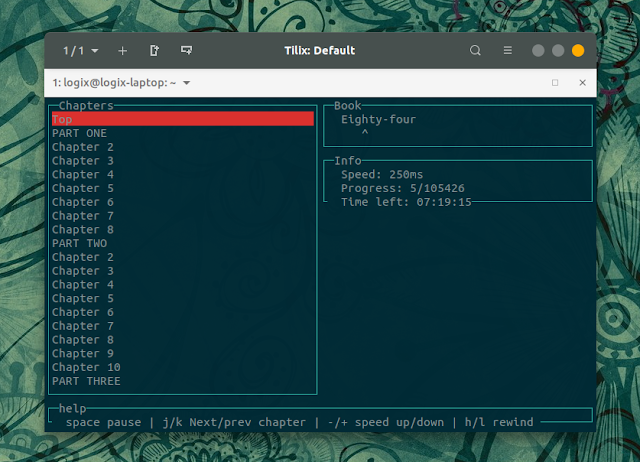 Uniread also displays some statistics, like the current reading speed, reading progress (read number of words / total), as well as the estimated time left to finish reading the book. The application lacks the ability to continue where you left off, but this feature is planned for a future release. An option to show multiple words might also be added in the future, along with various other enhancements, like incrementing the time longer words are shown. Update: Uniread now supports PDF files (it initially only supported EPUB). To be able to install Uniread, you'll need npm and Node.js. See how to install this in Linux, Windows, macOS, and so on HERE. For Debian, Ubuntu and Linux Mint (and other Debian-based Linux distributions), you may want to check out our article on installing and properly setting up Node.js and npm (including how to configure npm to install packages globally without root). Replacing /path/to/some-book.epub with the path and filename of an EPUB / PDF e-book. Use space to pause it, j / k for the next and previous chapter, + / - to speed up or down the text display, and h / l to rewind back or forward. Press q when you want to exit Uniread.